Go to original pattern for design DROPS 153-19. Knitted DROPS poncho in garter st with stripes in ”Alpaca Bouclé” and “Cotton Viscose”. Size S-XXXL. Measurements (measure after shaping): Width: 42-48-54-59 cm (37-42-47-51 cm). Length before assembly: 106-121-133-144 cm. Circumference in the neck: 65-74-81-85 cm. DROPS CIRCULAR NEEDLE (60 cm) size 5 mm – or size needed to get 16 sts x 30 rows in garter st with 1 strand Cotton Viscose or 1 strand Alpaca Boucle = 10 x 10 cm. Piece is to be soaked and stretched to correct measurements, so cast off even though some cm remain. Worked back and forth in garter st and sewn tog when finished. Loosely cast on 59-67-75-82 sts with Alpaca Bouclé on circular needle size 5 mm. K 1 row (= WS). Turn piece. Then work as follows from RS: Work in GARTER ST - see explanation above, AT THE SAME TIME work STRIPES - see explanation above. When piece measures 27-32-37-41 cm, insert a marker in the piece. REMEMBER THE KNITTING TENSION! 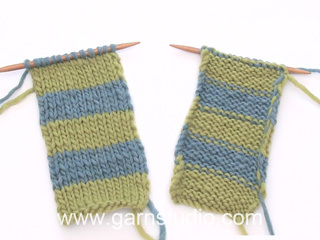 Continue in garter st and with stripes back and forth until piece measures 102-116-128-136 cm in length – READ TIP! Adjust so that last stripe is in Alpaca Bouclé. Loosely cast off. Cut and fasten the yarn. Fold A to B so that the distance between A and D = 10 cm. Sew short side tog with one long side so that C is sewn to F, and D is sewn to E (E = marker) - see chart. 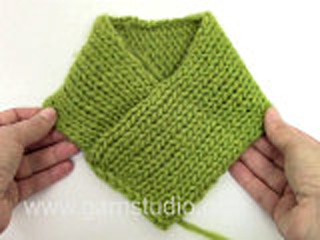 Where are ridges (garter stitch K2) placed in this pattern? 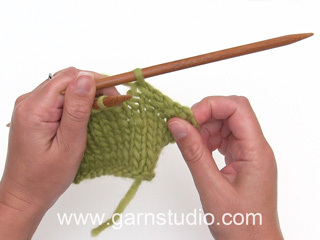 Dear Elaine, all the pattern is worked in garter stitch, it means that 1 ridge = Knit 2 rows. All the time the same way. The stripes and this texture result from the use of 2 different yarns. The first ridge (2 rows K) is with Cotton Viscose, the second ridge is with Alpaca Bouclé. Happy knitting! 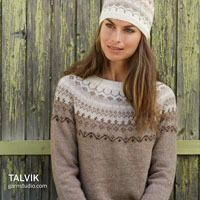 Hej Carina, Ja men du skall ha både DROPS Alpaca Boucle OCH DROPS Cotton Viscose. Lycka till! Jag undrar hur denna poncho ser ut på ryggsidan då man har den på? Jag antar att den är rak där. Den är väl "spetsig" endast framtill? Hej. Ja det stämmer, den är inte spetsig bak, endast fram. Se gärna videon som heter "Axelvärmare - montering" under fliken videor på detta mönster så ser du. Lycka till! Dear Yvonne, the marker placed after 27-41 cm (see size) shows how to sew the poncho together. "E" in diagram will be sewn together with "D" - see measurement chart. Happy knitting! Buonasera Anna, può trovare le misure del modello a destra della foto, sotto il titolo. Buon lavoro!! Hoi weet iemand of de drops alpaca boucle prikt. Er zit nl wol in, daar ben ik normaal heel gevoelig voor. Alpaca Bouclé is echt heel zacht en prikt niet. Bovendien bevat het alpaca, geen wol, dus ook geen lanoline - het is dus zelfs geschikt voor mensen die allergisch zijn voor wol. Buongiorno Cinzia, se ci spiega cosa non le torna esattamente possiamo aiutarla in modo più preciso. 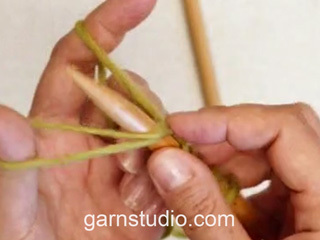 Altrimenti può provare a scrivere un post nel forum DROPS allegando una foto, o può mandare una mail a italy@garnstudio.com con un foto del suo lavoro e spiegando il suo problema. Buon lavoro! From the US... does this come in crochet? how hard would it be to learn with this pattern?